Luxe leather for the female gaze. 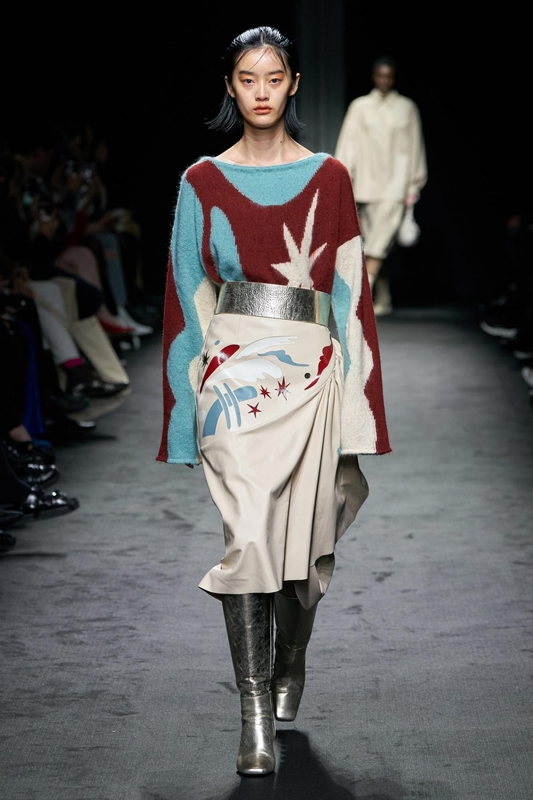 DROMe, an Italian brand based in Florence and fronted by Creative Director Marianna Rosati, showed their FW19 Pret-a-Porter collection this past Paris Fashion Week titled “Diverging Symmetries”. DROMe is often associated with integrating leather into their evening and day wear, often taking a sophisticated, minimalist approach to each collection. DROMe for FW19, took inspiration from a bevy of artists including the Romanian sculptor Constantine Brancusi and the portrait collection of Cynthia MacAdams “Emergence”. Together, it proved a strong feminist statement.Cynthia MacAdams spoke to W Magazine and declared: “I looked for women who had strength and softness in their eyes and a directness in the way they dealt with their life.” Inspiration also came from photographer Norma Quintana, whose intimate portrait series of traveling circus performers captured a new idea of freedom and expression. DROMe’s show notes described this season’s DROMe woman to “have these unique visions of life converge into the collection and find their expression through its protagonist: a confident woman, strong and independent, aware of her fragility and imperfections, graceful as an acrobat and fearless as a trapeze artist, every fall embraced as a natural part of the journey.” This translated into the strong silhouettes made for a self aware woman. The color palette of the collection focused on neutrals but had pops of color of emeralds (Looks 28, 31, 33, 38), pinks (Looks 25, 26, 31) and reds, including rose gold fabrics (Look 15) used in a few looks, giving more visual texture to the collection as a whole. 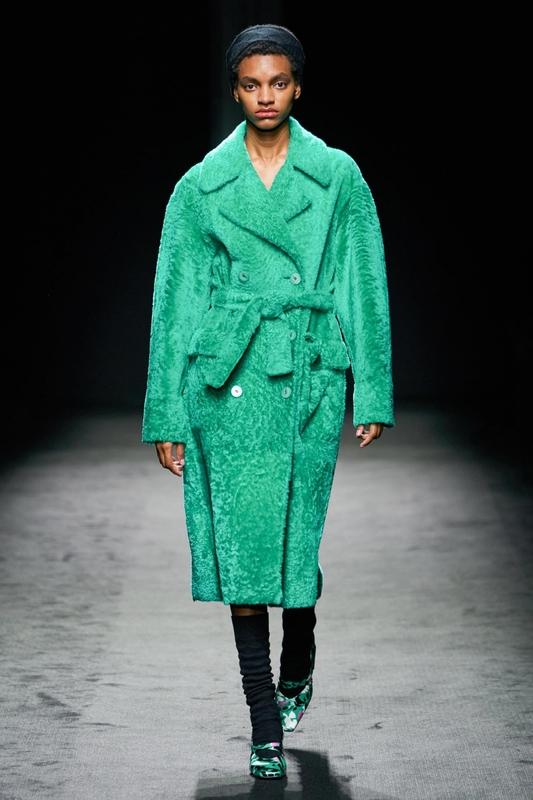 Patent leather and appearances from shearling (Look 28) were also notable. Patterns in fabrics were continued in shoes and boots which gave a sense of flair and interesting cohesiveness. Since DROMe is also a leather house, many silhouettes appeared boxy but were often given shape with leather belts or a sling bag worn across the body. Like the bags, the shoes ranged from sharing the same patterns seen in clothing, to also a neutral palette, which translated to the tones of Constantine Brancusi's sculptures. Shoes worn with a 90's-esque square toe were accompanied by a knee high sock, giving a nod to the 60's trends that were given new life during the 90's. Over the elbow gloves were one of the highlights of the collection as they helped complete looks that sometimes came off as almost too minimal. Makeup was toned down, with a neutral lip and light brown eyeshadow, which gave off a subtle eeriness, having models appear ghostly. Hair was complemented with either a leather headband or beanie. DROMe FW19 Full Collection via FF YouTube Channel. There were some really strong, tailored outerwear looks, that genuinely had me whisper to my friend “I need that”. There were also some looks that were over styled and even some that had the complete opposite effect and fell flat. It felt that the collection sometimes struggled to find that equilibrium. The collection had some moments of pattern clashing that could certainly work on the right consumer, but it did not always feel cohesive when compared to the rest of the collection. Sami is a 22 year old New Yorker living in Paris. She works as a freelance fashion editorial stylist and streams video games live on Twitch.